Information: Mars shows a distinct hemispheric asymmetry in the distribution of surface features. The often densely cratered southern hemisphere is about 1 to 3 km above the topographic sea level, while the northern hemisphere is sparsely cratered and generally lies below that level. The south, for example, has two basic types of terrain: an ancient crust saturated with large craters and small channels; and younger plains that have been modified less. The higher terrain of the south contains numerous channels, hundreds of miles long, that are reminiscent of those Earth bound channels caused by glacial activity and flooding. In the northern hemisphere, the terrain is largely featureless, save the volcanic flows surrounding the large volcanoes. 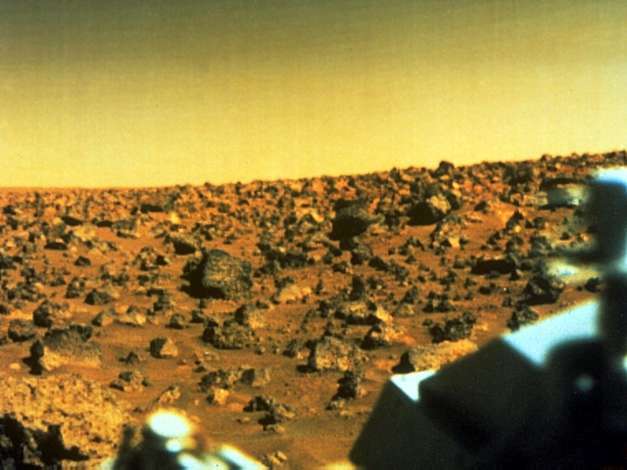 There is much evidence on the surface of Mars that its climate was once drastically different. Certain craters have odd ejecta patterns that suggest a layer of ice or water existed in the upper crust when they were created.